Snow melts on Mount Rainier and water runs off the Wilson Glacier and disappears under the NIsqually Glacier. Photo: Jim Culp | FlickrCC. In the Western parts of North America, mountains play a big part in the water cycle. Colorado and Washington snowmelt contributes to how much water is captured in the ground, used by plants, or makes its way into groundwater. It also joins streams and flows downhill to cities and rural areas. Climate change can have a big impact on snowmelt as global average temperatures rise. Water on mountains deposited in the form or rain or snow either evaporates or flows downhill. 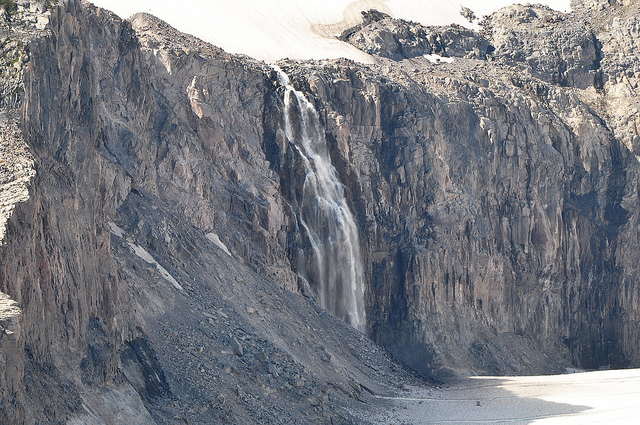 The way that water collects on the mountains has an impact on water flow. Rainwater tends to disappear more quickly, while snow takes longer to melt and allows for a more consistent, and longer, addition of water to streams and so watersheds. The result is that, as we saw in Washington in 2015, if it doesn’t snow enough, you don’t get as much water coming down from the mountains in the spring and summer, and you end up with a drought. According to a study performed by researchers in Colorado, rising temperatures can have a hug impact on how much water makes it from the mountains to the lowlands. Higher temperatures generally mean less snow, though not always less precipitation. But as we’ve already seen, snowmelt has a more gradual effect, and if water isn’t running downhill, it needs to be brought from reservoirs and other sites. The key take away from the study is that water resource managers need to know how different forms of precipitation interact with their local environments, in order to best budget for water consumption during growing seasons. Although the researchers have more work to do on the subject, this initial study should help western states and provinces deal with potential droughts a little better.